From Lodi, California, Travis received his formal training at the Musicians Institute in California but was learning to play "by ear" at age 11. Once Travis began learning, he said he would read and play the "licks" in the guitar magazines and he and a friend, also learning to play guitar, would "comp a lot" from CD's and radio. At one point they formed their own small band, but beyond rehearsals it never came to anything. In high school he said he was "still doing his own thing" until joining the jazz band in his junior year. he said it was "a fun experience, being part of the rhythm section, we had the freedom to work out the arrangements on our own". At this time he was also taking lessons from a local guitarist, Mike Simone, who "like to jam". Travis said Mike taught him a lot during his high school years. Travis also worked with his cousin, Dennis Sebastian, who released a CD "a couple years back". During that time, they recorded and performed together. After High School, Travis went to Hollywood to study formally at the Musicians Institute where he says he was taught by "some of the best guitarist in the world", but one guitarist/instructor in particular, Bill Lafleur, really took the time to show him what he "really needed". Bill open his eyes and to see his potential. Travis said, "he just knew where I was coming from". Travis has released three CDs, "Through the Valley" in 2004, "Just Let It Flow" in 2007 and his latest "Smooth Urban Night" in 2008. He has performed at The San Jose Jazz Festival and as part of The Crocker Art Jazz Series. He can also be seen and heard performing at the PASOS Vineyards "Smooth Summer Night Jazz" sessions in Lockeford, CA and also at other venues in Elk Grove, Turlock and Sacramento, California. With the release of "Smooth Urban Night," in 2008, Travis provided us with songs to enliven our hearing experience. Between 2008 and 2010, Travis worked on writing tracks for his next music album. In 2010, he released 11 tracks on his all-instrumental CD titled "U" on which he plays a custom-made flamenco-sounding Gibson guitar. From another article in the Stockton Record, Travis said, "I was writing in a Spanish tone. Peter White-esque tones. I had to really get in and find the personality of this guitar. It really produced some great tones." "U", which Travis says is a reference to his wife. "This is you", can be purchased online at CD Baby. DCB:	Based on my current information, you began to play the guitar "by ear" at age 11. Was music a part of your life before the guitar and what was it about the guitar that attracted you to it? TV: That's right, started playing guitar on my grandfathers old acoustic, which was given to my brother, I would sneak in the room when he wasn't home and play it. Music has always been in my life since earliest memories, as a family none of us played an instrument, until I picked up the guitar, but the house was filled with popular music that came from the late 70's, 80's. DCB:	With all the other genres of music to play, why did you decide to become a jazz guitarist? 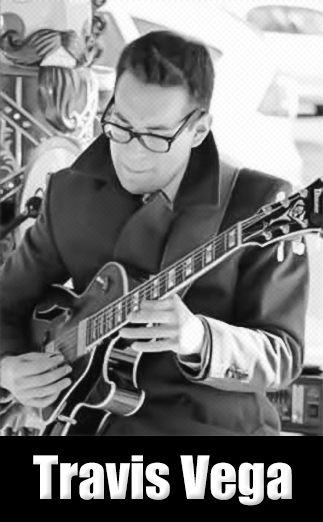 TV: What attracted me to jazz guitar was the influence that Wes Montgomery had on me. Wes Montgomery was a self-thought guitarist, who had a unique approach to the guitar, visually he looked like other guitarist, but never used a guitar pick, instead used his right thumb for soloing and comping. His playing alone has stood the test of time, combining "block chords" which are inversions of various chords to create this melodic and rhythm combination that at that time was genius, while his improvisations always changed, his phrasing stayed articulate, innovative and lightning fast, his tone was full and round. That's what I wanted to do, have his technique, use his style of "block chords" and phrase just like him, but as I grew I found that I have my own unique style on the instrument and plus others have tried to achieve what I tried, but always fell short, you just can't match the master. DCB:	When did you begin playing in your first band and when did you form your current group? TV: I started playing with my cousin, who also produces when I was 15, at that same time I was already doing recording sessions, once I started my recording career at the end of my teens that's when the first band was formed, now the main staples of my group is myself and my brother/percussionist Jason Vega, he has played with me through out and we filter other musicians to round out the group, but that part of it is always changing. I couldn't do what I do without my brother. DCB:	You said you could not have accomplished what you have without your brother. It sounds like he was a strong positive influence. TV: I have three older brother, I am the youngest, so I grew up listening to what ever they were listening to from rap, rock, r&b, classical, and pop, it was all over the place, but my brother Jason would quiz me for instance, who's singing this song, who's playing it, etc. at a early age, so I knew what was hip when I was in the third grade, lol. And once I picked up the guitar, we just kind of bonded even more and he picked up the percussion, first the drums then the congas, bongos, etc. we were able to morph what was a quiz game into this art form that grew from us playing together and to this day we are growing and evolving and we hope this process never stops, I couldn't do what I do because he help laid the foundation that still is growing, all my family members has had a major part in my accomplishments. DCB:	What influenced your choice of songs on your new CD? When someone listens to the "Smooth Urban Night" CD, what would you like for them to take away from the experience? TV: I am a strong believer of playing music that just feels good and in doing so I perform all my material first before recording them, so I get that immediate response from the crowd and they sure do let you know. I would like everyone to experience that consistant vibe of groove that balances itself with great melody and progressive rhythms, that's my goal with this project, to really showcase to everyone that this project came from the stage to your music player. DCB:	What other thoughts about your music, would you like to share? TV: During my short tenure as a recording artist, I have come across folks who don't have the best interest of there artist at heart, they manipulate, lie and even steal from the very people they are suppose to help. With my personal experience and having gone through these examples, I would like everyone to know that true music, true musicianship and true passion will always prevail and will always be honest and pure. Music has provided a wonderful living for me, one where I am able to share what the Lord has given me and as I grow and mature, I am blessed to work, perform and share knowledge with some of the brightest musicians, always fueling that passion that we all feel for music, life and love. 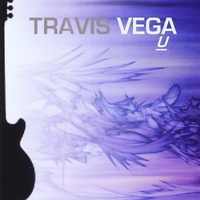 Full Authority Music Group Recording Artist/Guitarist Travis Vega is back with his latest release, "Smooth Urban Night". Never to far from his infectious style of R&B, Pop, Latin and Chill; Travis again delivers a stunning performance with his cycle of Smooth Jazz with his latest effort "Smooth Urban Night". Straight from his 2007 release "Just Let It Flow", Travis was quick to lean on the success of "Just Let It Flow", which produced hit single's "Don't Be Late" and "When Ever Where Ever", right up that alley is his latest singles, stemming from his newest release "Smooth Urban Night"; hit tracks "It's All Good", "Vega Motion", title track "Smooth Urban Night" and retro groove song "Like It Like That". 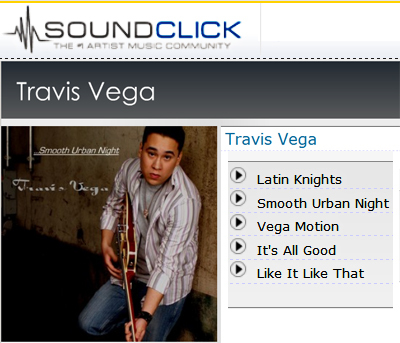 Third's the charm with Travis Vega and his latest release "Smooth Urban Night". Don't miss a step with this Full Authority Music Group Recording Artist, please visit www.travisvega.com and www.myspace.com/travisvegamusic for all the latest information. 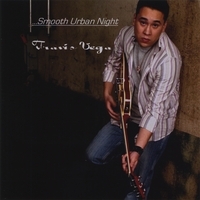 To Purchase "Smooth Urban Night", please visit travisvega.com or CDBaby.com. "Smooth Urban Night" is also available on most major digital distributors, iTunes, Napster, and Amazon.com. "Sometimes, as if out of nowhere, a CD comes along that both surprises and delights. 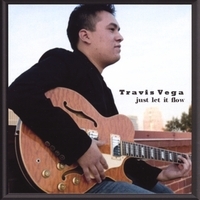 ‘Smooth Urban Night’ by Northern California based guitarist Travis Vega is such a recording. With a title that sums up to perfection the mellow and sensual groove that permeates much of the album, this independently produced release, for which Vega writes and produces throughout, is, in its entirety, a chilled out delight." Travis Vega with his brother J.D. Vega on percussion.